NCCPR Child Welfare Blog: Scandal at New York City’s parking place “shelter”: Everyone should be shocked. No one should be surprised. Scandal at New York City’s parking place “shelter”: Everyone should be shocked. No one should be surprised. The current revelations are a lot like the 2016 revelations, which were a lot like the 2014 revelations. And a New York Times story effectively predicted it all – on the day the shelter opened in 2001. 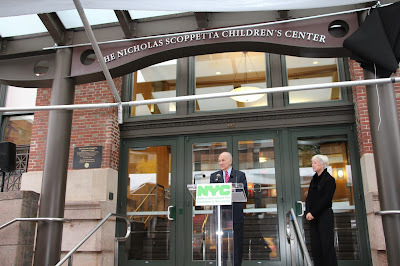 The late Nicholas Scoppetta speaking at the shelter that now bears his name. Administration for Children's Services. But the shelter was one of his mistakes. UPDATE, MARCH 29: ACS Commissioner David Hansell acts immediately - to pass the buck! Read our update here. If you build it they will come. If you keep it open they will stay. If it stays open long enough it will become a hellhole. Second rule: It doesn’t matter how pretty the place is. It still will become a hellhole. Third rule: It will happen no matter what, but it’s more likely to happen during a time of foster-care panic, a sharp, sudden increase in removals of children from their homes. The latest case in point: the Nicholas Scoppetta Children’s Center, run by the New York City Administration for Children’s Services (ACS). This week NBC New York ACS workers who described “chaos, physical fighting, and overcrowding” at the shelter. This story was a follow up to earlier stories by NBC New York and the Chronicle of Social Change revealing that the neglect of one youth was so bad and so prolonged that a judge held the current ACS commissioner, David Hansell, in contempt. But this isn’t the first such expose. There was a similar story in the New York Post in 2016 and DNAinfo in 2014. And no one has any right to be surprised. That’s not just because this cycle has been repeated all over the country. It’s also because in 2001, on the very day the renovated landmark New York City building was opened, replacing a hideous makeshift space, a New York Times story essentially predicted it all. [S]ome child welfare veterans see dangers in the very spaciousness and beauty of the new building, that it will become a place where too many children will be kept for too long. They remember the last city-run Children's Center, a six-story emergency shelter on Fifth Avenue and East 104th Street that a previous administration bent on reform closed down amid scandal and litigation in the mid-1970's. But there is a reason. See Rule #1 above. Children disappeared nearly 1,600 times from an Administration for Children's Services facility, which many of them described as being a cramped and chaotic environment plagued by bullying and theft, over a 13-month period, DNAinfo New York has learned. Dozens of kids housed in a city-run foster-care center are labeled “emotionally disturbed persons” and hauled next door to Bellevue Hospital, where some get drugs to sedate them … The 55-bed Children’s Center houses wards of the city, from newborns to 21-year-olds. They can spend days to months in the chaotic and dangerous place. One ACS commissioner who seemed to understand at least part of what needed to be done was Gladys Carrion. In October, 2016, she announced an initiative to place more older youth directly into foster homes, bypassing the shelter. But that promise came shortly after the death of Zymere Perkins, which led to Carrion’s ouster (officially, she retired) and her replacement by David Hansell, who has retreated from reform, allowed a foster-care panic, and dissembled about the existence of that panic. The largest spike in removals involves so-called emergencies, in which workers remove children on-the-spot, without even asking a judge first. These also are the placements for which there has been no preparation beforehand – so these children are likely to be hardest to place in homes, and therefore most likely to be dumped into the shelter. So now, all of the problems have been compounded by overcrowding. The shelter was built for no more than 55 children. But earlier this month it reportedly housed 94 youths. In the wake of the media attention, ACS now says it’s down to 67. After WNBC’s revelations, Hansell announced “reforms” – but they revolve mostly around making the shelter more like a jail – more security officers and more security cameras. In fact, the only way to fix a shelter is to do what Carol Parry did in 1977 – shut it down. In the meantime there is one small change which could at least improve the worst of the conditions there: David Hansell’s biggest concern is polishing ACS’ image; it’s at the center of everything he does. It’s not that he doesn’t care about the kids – of course he does - but he cares at least as much about image. I think it’s why he was chosen for the job by Mayor Bill de Blasio -- whose primary concern seems to be not being blamed for the next Zymere Perkins. I think that’s why Hansell has retreated from reform and at a minimum tolerated the foster care panic. So I suggest one simple change. Rename the shelter the Bill de Blasio / David Hansell Children’s Center. Do that and they’ll have the place cleaned up in a nanosecond!